When coloring hair, there is always some uncertainty about what the end result will be. Several things come into play, such as the integrity of the hair, its natural tone, what colors have been used in the past, and so on. In my previous post, What To Expect When You’re Going Blonde: Part 1, I mentioned that a big color transformation requires patience and a lot of trust in your stylist. Understanding how the process works from start to finish can make going blonde a lot less scary and stressful. A common challenge for clients is they feel their hair is not light enough, or they feel it is “too brassy” after the first highlight appointment. As I mentioned in Part One, Kyle of Gordon Salon in Lakeshore East, taught me that hair can only lighten so much in one sitting. Additionally, Kyle taught me that naturally brunette hair is often warm-toned underneath. The challenge of combating warmth is a necessary step in the process of going blonde for most people. When lighteing (also called "lifting") hair with natural warm undertones, we can expect to see some brassiness. When Kyle added the toner during the first appointment, the orange disappeared and we achieved our step one goal. A toner is how stylists are able to get an exact match to your desired color. Whether the goal is to add warmth or remove it, using a toner is how the stylist is able to cancel any unwanted undertones. Breaking through warmth is one of the hardest parts about going from dark brown to light blonde. As you can see by the photos, there were several weeks during my transition where my hair was a copper-brown-orange-color. Even though my eventual goal is to have minimal red undertones, I knew from my consultation with Kyle that lightening my hair too much in an attempt to get rid of the warmth right away would result in irreversible damage. This is where being patient comes into play. I waited a minimum of two weeks in between each appointment during this transition. Each time I went lighter. we made sure to protect my hair from breakage by adding Olaplex. Although, the most critical step in maintaining the integrity of my hair during this process was my homecare regimen. No matter what kind of products or processes are used for your in-salon treatment, finding the right daily home-care products can make a world of difference. Toner, although a great way to get your ideal shade, is not permanent color. Some clients may find that their toner beginning to fade before their next color appointment. 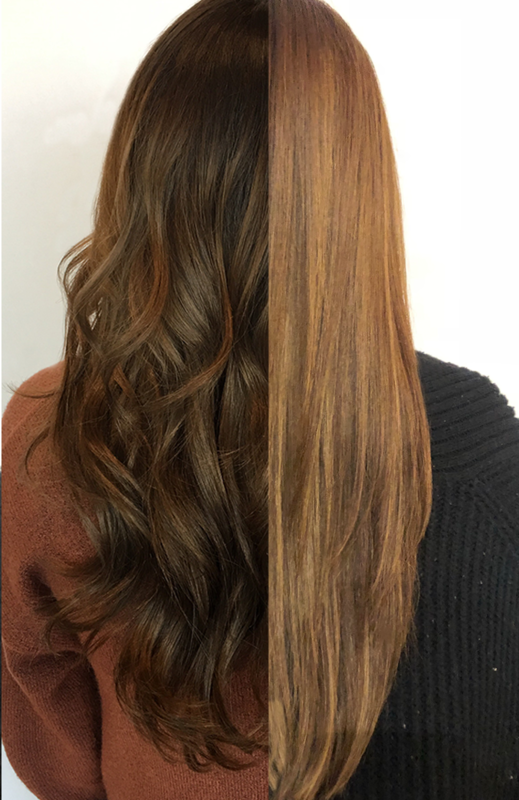 Gordon Salon offers an “Interim Tonal Refresher” in the salon which is really just a fancy way of saying it’s a semi-permanent color gloss that will revive your tone and get you through to your next full color appointment”. If there is no time to head to the salon for this quick treatment there are also ways in which you can maintain your color at home. Aveda has several homecare products that can help maintain the tone of your hair and also repair damage. These daily products help keep your desired tone from fading. 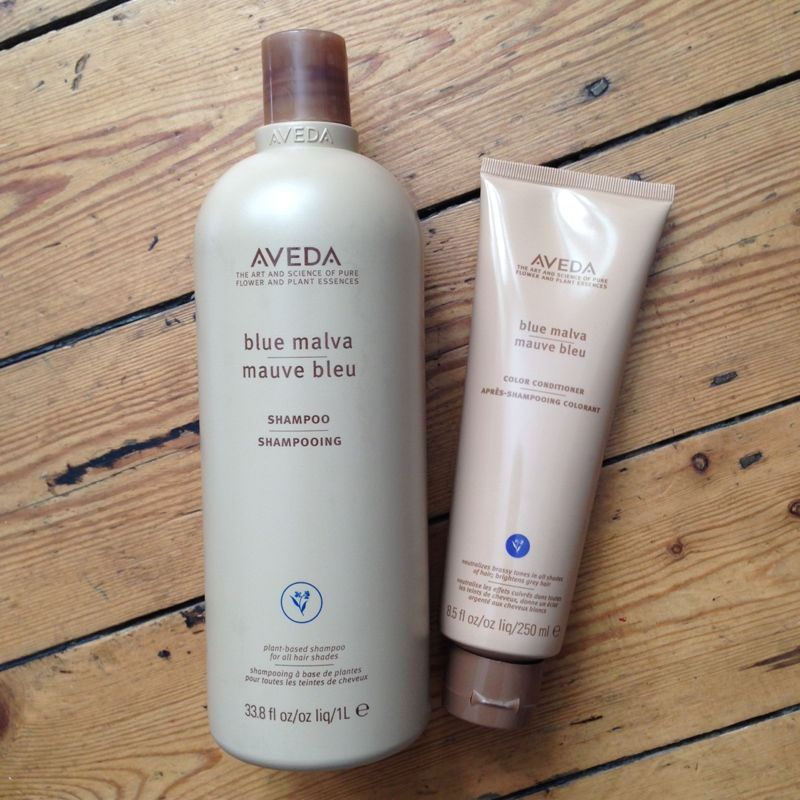 For example, the Blue Malva shampoo and conditioner is a great option for blondes who are looking to to combat brassiness. Using this shampoo regularly has made a huge difference for me when it comes to fighting warmth, and I will continue to use it. Lightening agents unfortunately leave hair vulnerable to dryness and breakage. Stylist’s always recommending a heat protectant, like Aveda’s Brilliant Damage Control (which is also great when trying to comb out tangled hair post-shower). Aveda has intensive masques that you can take home to use weekly, such as the Dry Remedy Masque and Damage Remedy Intensive Treatment to combat these respective issues. The Damage Remedy line is great for clients who are looking to take care of their hair after going lighter, as it uses natural ingredients like quinoa protein to help rebuild the bonds of your hair. A personal favorite of mine is the Damage Remedy Daily Hair Repair. This is a leave-in daily treatment that helps to repair, but also protect against future damage from heat styling. I love this product because I can put this in my hair after towel drying, and let it air dry or style with heat and it will protect while also repairing damage. If you are frequently coloring, lightening or using hot tools on your hair, be sure to ask your favorite Gordon stylist about an Olaplex treatment to repair the bonds that become broken when doing these things. Remember to use a heat protectant and deep conditioner to keep your hair looking and feeling healthy. If you are concerned about maintaining the tone, tonal refreshers inbetween services are a great solution. Aveda has a line of products specifically designed to target these issues, like the Clove or Black Malva shampoo. If you’re planning on making a color change, make sure you ask about these additional services and at-home-care products next time you stop into Gordon Salon, so that every day is a perfect hair day.